To Anne Hill, mother. From Elin Hill. 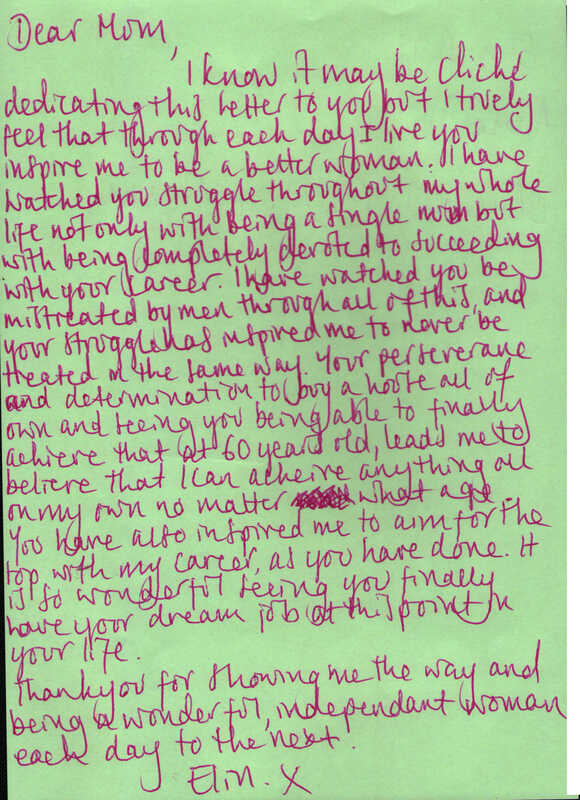 I know it may be cliché dedicating this letter to you but I truly feel that through each day I live you inspire me to be a better woman. I have watched you struggle throughout my whole life not only with being a single mum but with being completely devoted to succeeding with your career. I have watched you be mistreated by men throughout all of this and your struggle has inspired me to never be treated the same way. Your perseverance and determination to buy a house all of (your) own and seeing you achieve that finally at 60 years old, leads me to believe I can achieve anything all on my own no matter what age. You have also inspired me to aim for the top with my career, as you have done. It is so wonderful seeing you finally having your dream job at this point in your life. Thank you for showing me the way and being a wonderful, independent woman each day to the next.